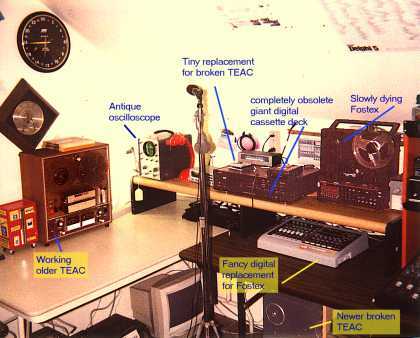 The Hickock scope on the left has a U.S. Navy manual specifying standard repair procedures for two — one to fling the technician from the machine and initiate resuscitation. 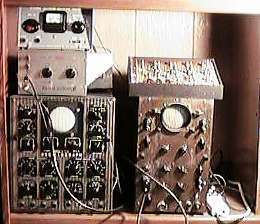 You’d take a tube out of your 30s radio, use the cable in the top there, plug it in where the tube used to be, and then plug the tube into the set tester. Voila! 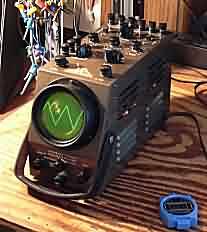 You could see all kinds of interesting voltages and currents while the unit operated! 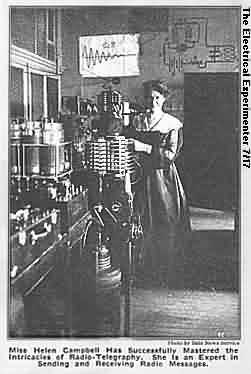 These wonderful devices declined with the advent of multiple-grid tubes, whose much higher gain made them fatally sensitive to several feet of wiring. 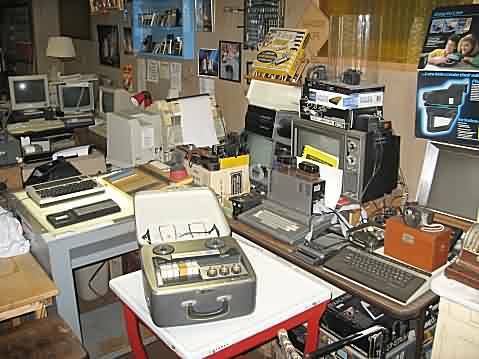 Yesterday’s beloved in-circuit emulator (“ICE”) did pretty-much the same sort of thing with your microprocessor, and, similarly, is itself gone to the antique-technology basement, as ever-faster devices make inserted cable runs of a few feet impractical. 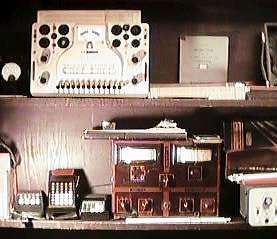 Another typical basement shelf with set testers and meters, and a broken TRS-80 computer. 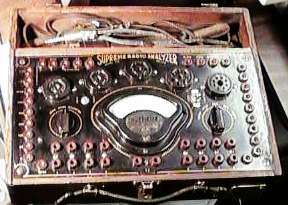 The earnest old-timer claimed it was a “megger” and used to find breaks in long cables by cunning resistive techniques. 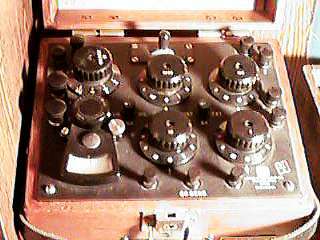 But I don’t think so; I happened to come across the term elsewhere as a high-voltage post-war kind-of instrument used to measure insulation quality, and this isn’t it; it uses batteries, goes up to 10M ohms; although I suppose 1944/46 are postwar; but it looks pre-war. ... The rest of his story might be true, although I still don’t understand how measuring high resistances will locate cable faults — but then I revel in ignorance. ... The old-timer was trying to flog the thing and I guess he promoted the fancy $ounding name. ... And wouldn’t he be surprised to learn ebay has one of these things today (described as a “resistance bridge”) for $250! This tube tester is a little larger and newer than the others in my assortment, and presumably tested many a tube in the 50s or 60s. 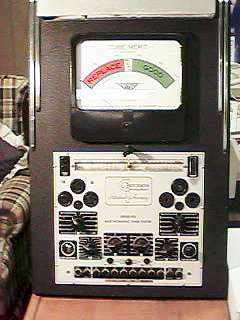 Yet another exciting tube tester. Of course no basement is complete without chord organs. On the left is one of those plastic things that must’ve made many a Christmas merry; the other is the more professional instrument, with many more chords. They differ in tuning by just about a quarter note. Where are the calculators of yesteryear? ... In my case, many of them are still in my basement. 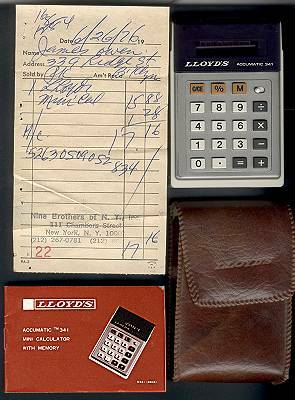 This well-preserved unit works perfectly; that’s the original 1976 receipt from some place on Chambers Street. 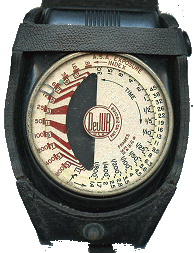 Or this beautiful light meter — apparently just my age, the little fellow! And Organ pipes ... in the attic of course. The living room is host to one of the latter-day Hammonds + a Macintosh SE in transit. ... The Mac hasn’t really done much for me (well that was then; but see the also-useless imini), but the Hammond was fun to play, even if outstandingly cranky, and beyond that now. 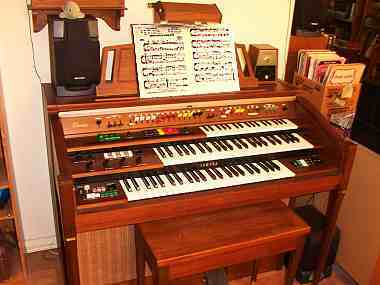 Then there’s the Hammond Chord Organ. 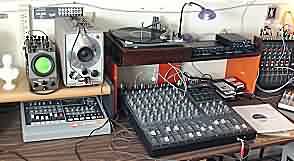 All tubes; no transistors or whirling wheels here, just solid 40s tube technology. 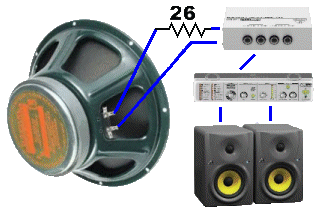 There are at least three tone generation systems in it: the monophonic solo voice controlled by the highest note on the keyboard, and to which most of the stop tabs are devoted, the polyphonic keyboard, and, finally, the separate chord oscillators! 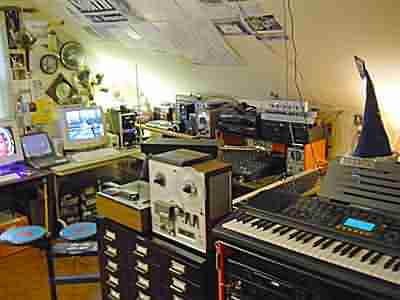 All the notes for the solo voice are produced, of course, by a single set of tubes, with a keyboard full of coils adjusting the pitch. But even the polyphonic notes are shared — 3 keys to an oscillator in the lower part of the keyboard, and then 2 per in the upper! Every tube counted in those days. ... The resulting mix of individually-tuned solo, polyphonic, and chord tones is very sweet and unmechanical; it’s almost as if they knew what they were doing! 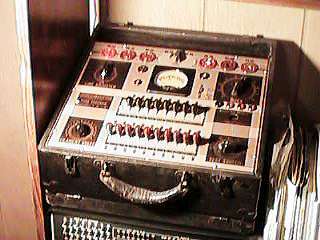 The picture doesn’t show the two simple foot pedals which provide the oom-pah bass, or the emphasis bar in front of the chord section; these features provided all the beat there was, in an age before rhythm machines. 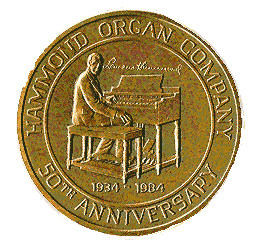 ... Near the beginning of my second decade on this beautiful planet a Hammond Chord Organ appeared at the local “Hudson Guild” community center, and drove me mad with longing; I can still remember it vividly, if obscurely, a gleaming shiny beautiful powerful machine — it was so beautiful beautiful! ... Indeed, my longing for electronic organs transformed them all into transcendent mystical toys, and I can still just barely recapture the feeling of longing and religious certainty, that if I could just get my hands on one of these machines, oh the joy the beauty the shiny tabs! 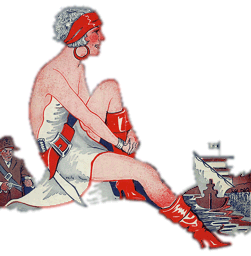 ... All of course utterly beyond and outside today’s nevertheless charming reality. ... 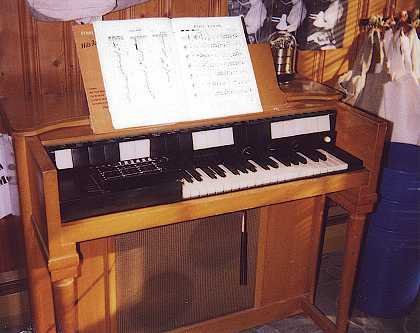 I believe Hammond Chord Organs also found homes in low-rent commercial joints, as a cheap substitute for the real thing; I can almost remember it, and I have some “semi-pro” (I can’t play it) Hammond-chord-organ-specific sheet music. 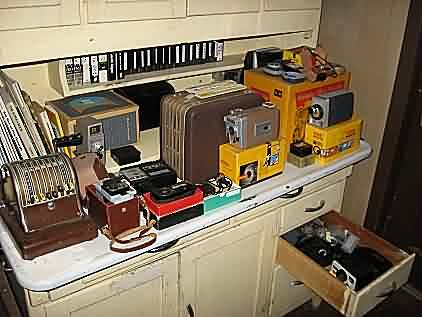 ... My beloved treasure was $50 — it is paint-speckled — but I bargained the historical society up to $150 including shipping — I learned my lesson with the DK40. 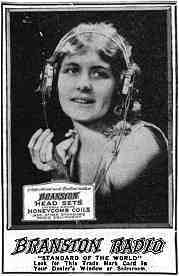 ... And be sure to google for “Hammond Chord” to see many amusing pages. I’ve repaired three or four keys, and once I stopped a terrible buzzing noise, basically by randomly changing every tube in the machine, but then there came a time of terror of fear of unexplainable sorrow: certain chords failed! ... 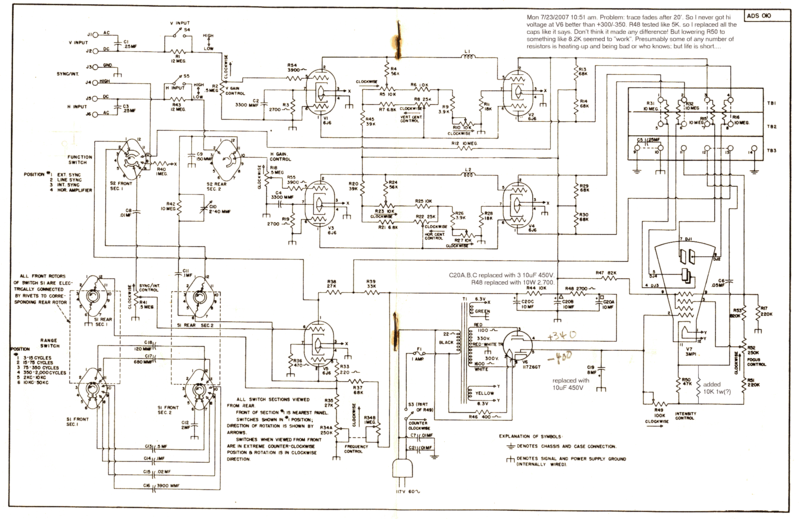 I puzzled through the manual (which I bought from the Organ Service Company) and pondered deeply, eventually producing the Secret Decoder chart-like thing over there, and deciding that a certain tube was bad. But before I ventured the repair, I procrastinated for months, frozen in laziness, appalled at what I knew would be the horror of taking the thing apart, armed only with my chaotic notes. In the event, my “single tube” theory was stupid because (1.) 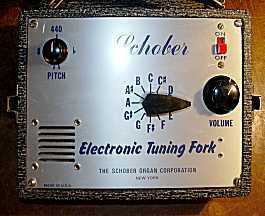 the other notes of the chord, not from that tube, would stop also and (2.) replacing the tube did nothing. ... So eventually, after additional months of delay, continuing deep thoughts produced a certainty that a particular capacitor was the culprit; it had somehow gone short, so when it was switched onto the chord bus, all the other notes would go bad; or something — in the event, the latter proved to be the case (i.e., “something”): when I took it apart and, intelligently distrusting myself, first tried resoldering the capacitor on both ends including the various resistors attached to the wiring points — that fixed it! ... And so what have I learned? ... Nothing. ... Well, actually, it’s like my analog tape recorder rule: it’s almost always the record/play switch, and cleaning/abusing such often fixed it. ... So the chord organ version would be, if it played yesterday, then probably one of the 5 milion switches got mysteriously dirty. Presumably from afrits in the night. 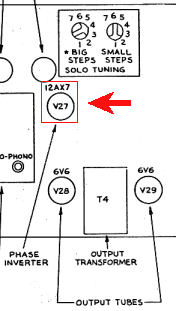 And of course I did manage to crack a 12au7 as I bolted the thing back together with my dangerous socket wrench. I never cracked a tube before, but I suppose it must’ve happened lots in the old days. It got real hot, the machine didn’t work good, and the tube was all sort-of frosty looking. ... A week of waiting for www.thetubestore.com, and the lovely chords call again! After many happy years, to be sure. ... But I failed. 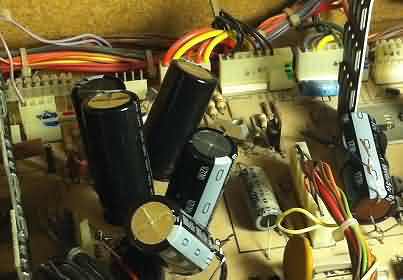 I had a theory about my beautiful but doomed Hammond Commodore, that if I subdued the monstrous hum in the power supply it’d improve its other problems, i.e. apparently-digital failure modes basically summarized by some ebay pilgrim the LOL found with my organ approximately, “it plays for a while, but then stops” but you could just “turn it off and on and it’d play again”. 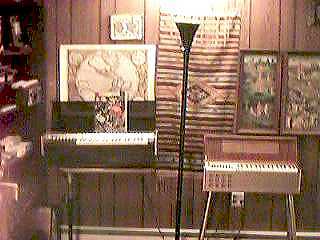 Another pitiful keyboard I’ve mistreated is my Wurlitzer electronic piano; I plugged an 8-ohm speaker into its output, which is a no-no. ... 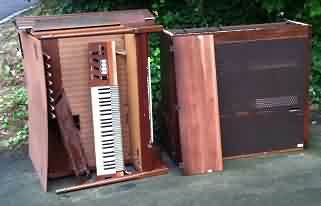 But the Wurly is still worth money! Today’s musical kids profess admiration for the sound and the thing. 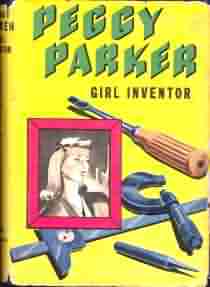 Part of this, I’ve realized, is its viability; the device was made as a miniature piano with tiny little amplified “tines” that the little hammers strike — that is, its innards are still early industrial revolution, and while the piano hammer action isn’t simple, it is at least fixable. 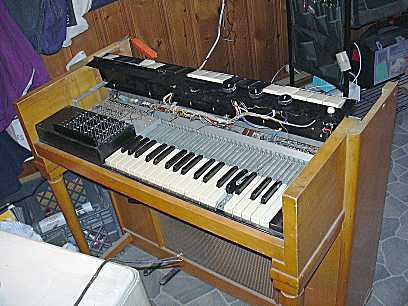 ... As opposed to the “action” of my Hammond and Yamaha, consisting of hundreds of transistors or worse on numerous interconnected circuit boards, requiring the comprehension of cryptic schematics to even see properly, much less understand. ... And indeed, I seem to have fallen on my sword before the electronics of my wurly, no matter how mechanical the action. But of course the bright side is, I made room for more organs! 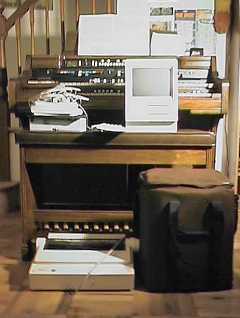 ... All I have of the Schober Organs (aside from charming recordings begged from the Schober community) is this device I bought in 1995 and fixed today Monday, July 7, 2003. 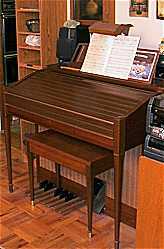 In my misspent youth I used to visit the Schober Organ showroom in midtown NYC somewhere and pester someone who must’ve been Richard Dorf aka “Mr. Schober Organ” (although I gather there was a Mr. Schober at the beginning). ... And I managed to afford at least one “demo” record — or maybe I got it somehow for free — which I played over and over again with childish yearning until, I think, the age of 23 or so. 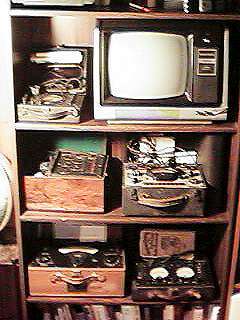 Yes I will sing of elderly beautiful gadgets past their time! ... Sadly the only thing I ever really learned to fix was assembly language, so my efforts are so pitiful ... but not complete failures! Well it would take a pretty big pocket for this wonderful ~1952 thing I picked-up at NEARC for a song — but then it turned on me, and the trace faded after 20 minutes or an hour. ... I fixed many things, some of them apparently broken, seemingly without the least effect, until I reduced the value of the fixed resistor that connected the intensity control and the CRT — and then we were all so happy! ... Confirming Owen’s First Principle: Cheat! ... Here’s s_11_a.png, a schematic with my barbarous mutilations. 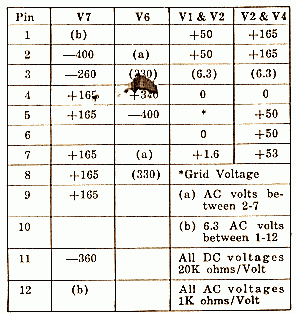 ... And s11avolt.png shows supposedly correct voltages at tube pins. ... So in the box with the scope there was an IBM manual: apparently this gadget was part of a customer-site set of tools one could order from IBM which, along with the Pocketscope, included a Simpson VOM, and an IBM-made (apparently) “Dynamic Timer”, the latter being used to fix IBM machines the nature of which I could not ascertain.